So it turns out the NHL has a few things to work on during its summer vacation. But things aren’t all bad! Here, in no particular order, are 15 things the NHL should never change. I feel strongly on this subject. Come to think of it, the way Dan Bylsma announces his starting lineups is up there as well. Think the National Hockey League is broken? Then tell us how to fix it. E-mail us at fixitgrantland@gmail.com. Your suggestions might be published on this website, so please include your name and the city you live in. Spend enough time living in the New York area and you’ll learn pretty quickly that it’s exceedingly uncool to get excited about a celebrity sighting. Like, c’mon man, act like you’ve been there before, you know? After all, we’re all just a bunch of dumb sweaty humans riding this packed subway known as life. Once I had to walk next to Ryan Gosling for nearly six blocks and act like it was no big deal, when it was a really, really big deal. When it comes to the Stanley Cup, though? All bets and decorum are off. Even the most blasé people love the thing. It’s catnip. They freak out when it enters the room, lose all propriety, want to touch it (or make a big production of purposely NOT touching it) and take pictures with it and ask over and over “Wait, is that real?” and tell fifth-hand stories about the time they heard someone used it to pour champagne all over their friend’s friend at a local bar. The Stanley Cup is Bill Clinton. If you’ve got 25 minutes, I’ve got the YouTube video for you. Don’t be ashamed to admit it: One of the hidden pleasures of the Olympics is that you get carte blanche to act in the manner of a 19th-century imperialist or a Cold War–era McCarthy spy for a few weeks a year. Statements like “The Dutch are actually bred for this event” or “Well, everyone knows you can’t trust the Eastern Europeans” are briefly seen as commentary. It’s a fortnight of chaos and unchaperoned fun, like senior week in Myrtle Beach. you pretty much get this all the time! The league is a melting pot, one that is always one enigmatic Russian away from the boiling point. Over the last few years, the NHL (and its U.S. broadcast partner, NBC) has invested time and resources into emulating some of the NFL’s successful NFL Films and NFL Network models. (The league’s COO, John Collins, came from football.) Results have been up and down — the NHL Network remains frustratingly understaffed, and some of the early efforts to mimic the successful 24/7 lacked the HBO series’ punch — but increasingly teams are getting into the mix on an individual level, with good results. 24/7 remains the gold standard of behind-the-scenes hockey programming, but shows like Oil Change and Becoming Wild, as well as the new Flyers production, show hockey players as humans while also underscoring just how difficult and unlikely the life of the professional athlete is. As Sean McIndoe points out, there are fundamental problems with the NHL draft. The system just feels suboptimal, like we ought to be able to come up with some other way. (Like Sean, I’m Team Gold.) But no matter what happens, there’s one draft-day tradition we must never, ever touch: the Official Overstaged Photos of Preposterousness. 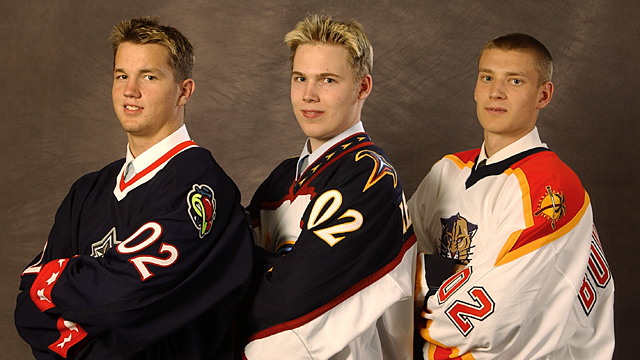 These are essentially the hockey equivalent of your senior prom photos — the draftees incidentally are all of senior prom age — but only if you had the kind of senior prom photos with the fake volcano backdrop spewing “LUAU OF LOVE 1996” in molten crepe paper lava and the doin’-it-from-behind pose. I’m mostly with Sean that the NHL is getting a little slap-happy next season with not one, not two, but six outdoor games, including two that feature the Rangers at Yankee Stadium three days apart, and one in balmy Los Angeles. It’s like going wine tasting and coming home saddled with two boxes and an annual membership just because that sip of pinot seemed pretty great at the time. Because the thing is, the outdoor games are pretty great. The Winter Classic is one of my favorite NHL events. It’s not because of some nostalgia for a lost youth spent playing shinny on the farmhouse pond or anything like that, and it’s not because I’ve had awesome seats. The games are, visually, just about as so-so live as they are on TV. In both games I’ve been to, I watched specks skate around on uneven, flooded ice. But I had goose bumps anyway, in large part from the feeling in the stadium. (I also had a ringing in my ears from the nonstop cha-chinging of the merchandise registers every 15 feet.) There was a communal bundled-up we’ve-been-here-tailgating-since-9-a.m. happy stupor, everyone there in celebration of hockey and/or commotions, most folks filled with civic pride. At some point, the NHL will hopefully find a steady-state equilibrium for the volume and the location of outdoor games. I think three or four could do — preserving whatever mystique remains, and spreading out locations while keeping networks happy. Can the NHL take the rare step of doing something in moderation? I guess we’ll find out. Just the best. They should make one sometime where the entire thing consists of the obligatory slo-mo scenes of (a) players stepping off the team bus in suits and wet hair, and (b) players sitting in an empty arena staring into space and/or taping their sticks. I guarantee people would still happily watch the whole thing, like a bunch of hippies noodle-dancing along as their favorite jam band plays an opening riff 37 different ways. It’s because of hockey that I learned about wrestling, what with all the “heel turns” and shifting rivalries and overenthusiastic announcers shouting about long-ago grievances. And while the hatred between two players or two teams (or two coaches) can sometimes take on a distracting life of its own, it can also elevate a game or a playoff series into a fascinating battle between athletic prowess and animal emotion. (OK, maybe “elevate” isn’t the right word for what happened last year between Pittsburgh and Philadelphia, but there’s no denying that it made for a compelling look into the psyches of stars like Sidney Crosby and Claude Giroux.) Speaking of Crosby and the CBC montages — this one was a major favorite last season. The NHL’s trade market has a pretty optimal ratio of hysterical speculation to “wait, was he on drugs when he said yes to that?” disbelief to hand-wringing hindsight to gleeful snap judgment to the use of the word “assets” to describe people to guys getting dealt midgame. Selanne has been in the National Hockey League since it consisted of a few polar bears wrestling over a frozen fish, and he will be delighting our great-grandchildren with affable postgame interviews many decades hence. So it has been, and so it shall be. Selanne will make Gordie Howe’s career lifespan resemble that of a fruit fly. Selanne’s résumé goes like this: kindergarten teacher, soldier, race car driver, professional hockey player. May he never add another line item. Teemu Forever. Right now there is an NHL fan reading this who is extremely affronted by my assessment of Nail Yakupov above. There’s an NHL fan putting the finishing touches on his 2013 chain mail jersey and refreshing Hockeyfights. There’s an NHL fan sighing in exasperation that the nickname 88kanergirl88 is already taken on Pinterest. There is someone who won’t shut up about how he’s taking his kid to her first game this season and there is someone who won’t shut up about how Nazem Kadri is gonna show everyone, you just wait and see. There are fans who call him Gary Buttman and are serious about it, and there are fans who are clogging everyone’s Twitter feeds with snippy arguments over whether the name of one stat is spelled Corsi or CORSI. (It’s the former.) There are old Slovakian men and young Swedish kids and Jay Baruchel, and all of them are just waiting patiently (some impatiently) for next season to start. I wouldn’t have it any other way.